GVS9000 VTR offers a number of flexible options for compressed to Uncompressed HD video, from single cameras, to as many as 16 concurrent capture, store and edit. (As new hardware is introduced, this number should grow) The key benefits and limitations are outlined below. The limitations are only based on the current software that available for real-time edit. The above workflow example is shown with 10 cameras and one mix station. You can start with a single unit or as many units as you require for your project. The key considerations are the video formats, storage requirements, flexibility and cost that would be associated with each workflow. The above ROI indicates the major benefits and associated profits with the GVS Metropolis Media Server workflow line. Primarily through low maintenance and operational costs, along with the deliverance of maximum speed and throughput, substantial increases in productivity become reality in multiple production environments. GVS offers the Nomadic 1U 12XPRO Optical media storage designed specifically to operate with low power consumption and noise reduction in order to make the product more suited for studio setting. With dual firewire 800 users have the option of easily mounting GVS qualified firewire drives for capture or play back of the audio/video content and proxy files, and easy transport of the content in a native format. This is an ideal format - very low cost, and high speed that is built into the 9000VTR. For protection, data gets mirrored on two sets of drives at the same time on Nomadic product family drives. After completion of capture or playback, users can simply remove one set of the drives from the facility and transport them to any location, and directly attach to FinalCut Pro, AVID, Flame, Inferno, Flint, Fire, Smoke, GVEdius or Premiere. With multiple drive sets you can also accomplish higher video quality 800Mbits up to SD and HD uncompressed, with addition SATA drive with 4 port interface in the back, user are able to reach 12 hours none stop single file recording and quality for 2K and 4K. 10 Gigabit XF SR, XF LR, CX4, AT2 and AF DA interface is 10G optional interface that offers file base share storage with editing stations. Thunderbolt 2 provides the solution to combining the channels together, Thunderbolt 2 enables two 20Gbps bi-direction channels instead of two sets of 10Gbps channels, you can now do 4K video over Thunderbolt. Fiber channel is the most ideal environment for more than one user and/or users in a live environment, offering both flexibility and reliability. 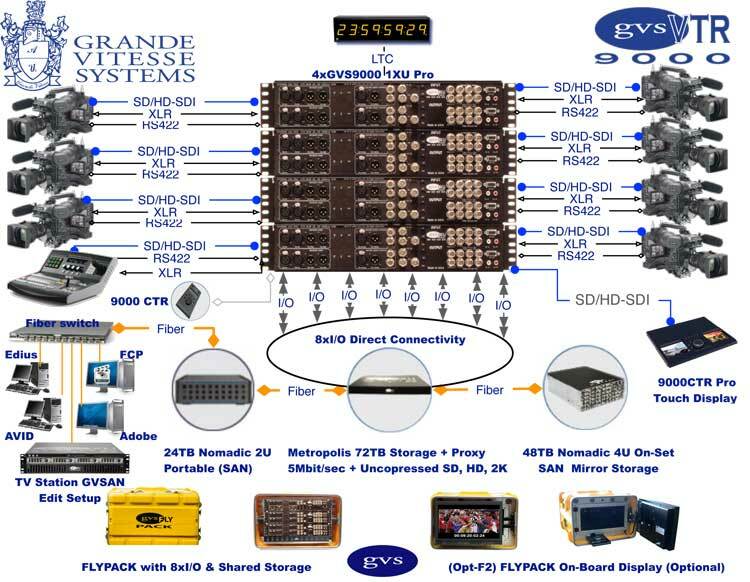 It provides multiple GVS9000 VTR devices to interconnect, with the highest video quality, allowing sharing of content over the fiber network, with numerous SAN software, and edit review can begin as data is being captured (GVSAN is offered at no additional cost with Nomadic line.) . For additional storage requirements, the Nomadic4U offers users expansion very easily and on-the-fly, without having any down time during the capture process.